Hannah tells me it’s been four days since I’ve blogged. 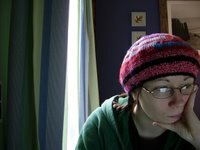 So here I am again (back finally!) to give you a run down on the past few days. Monday – fairly standard, I think. I’m having a lot of trouble remembering anything special which isn’t surprising. *Oh wow. Huge appologies (sorry Tom). Monday night we had a YITS catchup thingo – how could I forget. In around the Hawthorn area at Alecia/Laura/Em’s place. Heaps of them all came up. Tom and Jane all the way from Geelong (was very happy to see them), Dawn from Castlemaine. There was all kinds of carpooling going on and it was a generally enjoyable evening with some rather wonderful pizza that had pumpkin on it. Tuesday wound itself into something pretty spectacular (which is exaggerating maybe a bit), Geoff and I decided we’d have a ‘card playing’ night with Anita (his sister) and whichever of mine were home. I left uni early as I was feeling pretty blah. Slept for three hours when I got home and decided to not mention it so that the evening would still happen. It turned out Anita was babysitting and Laura had a uni friend over (others all out). So Colin and Tim joined the invite list. Col couldn’t come, so I unsucessfully tried to get on to Analise to make up some numbers, gave up and found Tony in my phone, after which Ana called and decided to come anyway. I was way out of it and there were frequent comments all evening about how dead I looked, but it was great fun. Wednesday was one of “those” days. Relatively horrible really. It started well. Caught the train with Geoff, Matt (from uni) was there too, and Gabe and he were on my bus. I get along well with both of them even though they mostly just talk about games… both friendly. I spent the lecture (which I couldnt really hear because he refused to turn his mic on) talking to Justin (the mature aged student) about the assignment and uni in general. This is the assignment that the due date was listed in one place as September 28th – it is wrong!!! It’s now due on August 28th, which is what I thought originally. I am of-course not impressed and tomorrow is going to be all about finishing it. Anyway, Justin’s always been really nice to me – I think it’s sadly got something to do with my work ethic, but I certainly needed it. I got the lecutre slides off him – these are the ones the lecturer refuses to give out to make people come to his classes, which is all very well, but really not very convenient for looking back on. I don’t want to know how he got them. So we were talking about how certain subjects were a complete waste of time and how people just talk through them etc. And I mentioned how really not happy I am with the course I’m in etc etc… He offered to buy me a coffee (just in a nice way) and just work on stuff etc… I declined and opted to go home as I was feeling pretty lousy. So, the bus trip back was full of ‘what next’ thoughts. Various ad’s around Box Hill station taunted me with, “She’ll find out what She’s Cut out For” etc… And Dad got a call from Johann (Dad’s overseas atm) which I answered, he had a brief chat to me and told me to stay in uni *glare* (I didn’t really want to explain the full circumstance so I just let it slide). The hard reality of the situation is that when it comes down to it, I really don’t want to continue in the course I’m in. There are quite a few reasons. The people are fine – but the level and quality of what’s being taught, and what it is just isn’t fitting. I don’t think it’s the area I want to end up in. But then, I don’t really know what is. I’m not at uni, ‘just to get a qualification’, I’d like to hope the three years would at least be fractionally interesting. At the moment I can’t see how I’d come out of the course knowing much more than what I already did, or what’s common sense then when I went in. I’m not being arrogant – sadly just realistic. I don’t want to not study, but I think I need to change angles or at least get into something that will stretch my mind. Of the evening – I changed my mind multiple times about going to the ‘girls’ thingo (Usual young adults stuff a bit different this week). I wanted to, but when it came down to it was feeling far too blah so I stayed home watched Two-Weeks Notice (veryaverage chick-flick) and went to bed at 9:00! Thursday. I am now definitely sick with something. After 14hrs sleep woke up with a headache and sore throat. It was pretty good day really. Easy. I worked most of it. Ebay stuff is going well. I will think about the assignment tomorrow. And so, that’s the rather boring run-down. Quality literature from a very tired mind. I shall continue no doubt in the next few hours to feel pretty lousy, make some dinner, have a shower, go to bed,read and then turn out the lights early again. btw. Isn’t that picture great! 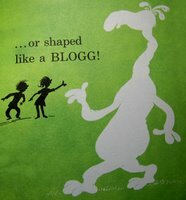 (the Blogg one) it’s from a Seuss book of the title of this blog post. oh, and you didnt spend a rushed coffee thing at your house with any sam’s on thursday either did you.